Despite increasing nerves I managed one of the best pre-race sleeps I’ve ever had. Waking feeling rested was a great start to the day. I had a quick pre-race breakfast of a bagel with peanut butter, jam and cheese along with a yoghurt then headed over to body marking. Staying at a hotel across the road from transition has it’s advantages I’d been body marked, set-up my bike and was back in my room in twenty minutes. I could rest up for another hour before getting into my race kit. It’s the perfect way to start race day and takes the pressure off. I got kitted up and wandered down in time for the pro start and to hear that Chrissie Wellington wasn’t racing. An early indication of what an exciting pro race we were in for this year. Once the pros had gone we were encouraged into the water, with half an hour till our start I hung back waiting. 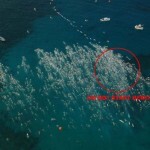 Where to start the swim was a point of concern after last year’s problems. A different buoy layout made the things simpler. Noticing that the middle of the field was thinner I headed there as it should mean less people to swim over me. There’s tension on the start line as everyone tries to keep their own space and not lose ground. We’re given a rough indication of how long to go, but it’s very rough and you know any moment the race could start. About thirty seconds after a two minute warning the cannon fired and we were off. It took ten metres for the mass of bodies to spread and my hands to catch water. From then on it’s a matter of following the draft. My choice in start position was perfect I missed any rough stuff and was carried forward in the huge draft. It’s still a tough swim and whilst I’m feeling better about swimming I never felt I gave it enough. When I reached the pier I was fairly pleased to see 1:06 on the clock. Faster than last year and without the aid of the swimskins. A clear improvement and I’d guess close to the equivalent of an hour in a standard wetsuit swim. A dash through transition, grab my bag, into the change tent and sort my kit out. I’m never one to really rush transitions but try to keep it simple so I don’t faff too much. Shoes, race number, a couple of spare gels, a Biest Booster and sunnies on. Swim kit in the bag and off to the bike. One of my goals on the bike was to settle into a strong pace early on. Last year I built slowly finishing strongly, but think I under performed for the first 90km. Though I was keen to push the initial section on Kuakini Highway is hectic and athletes hammered past. I knew I was working and stuck to my pace. Once out on the Queen K and heading to Hawi I started pulling back those places. The winds were light and mostly behind us so I made good time all the way to Kawaihae. There we turn to climb up to Hawi. It’s an unremarkable climb except for the wind and today was gusty. I moderated my effort knowing racing the climb would take me too far out of my comfort zone. After the turn around the speed of the descent was limited by my confidence with the side winds. You could see how far athletes were having to lean to stay on the road. I was pleased to hear from veterans that it was one of the windier days out there. Back on the Queen K that was it – time trial home. I’d practiced this twice in the taper the only difference today was I’d go easier. I was nervous I’d gone too hard too soon and might not have it in me to push. I took the second Biest Booster of the day and started the effort. My legs were there and I soon picked up pace. The wind was relatively light and speed was higher than I’d expected. No reason to let up I kept myself moving through the field aiming to make up as many places as I could. Near the airport I realised I could go under 5:05 and this seemed a perfect target. It helped me push right till I reached Palani once more. With a smooth transition I started the run with the race time under 6:20 meaning running a 3:25 would set a new Kona PB. Whilst that should be easy I was aware I’d not run more than 30 minutes in a single session during the past two months. With such light run volume due to injury what would happen next was a complete unknown. The smart approach would be to set off at 3:25 marathon pace. As I ran up Palani I realised I’d not calculated mile pacing for the run (being the US kilometre markers were only every 5km). More significantly I took a gamble and headed off at 3:10 pace something I’d have been confident doing at the start of August. It held together well along Ali’i Drive and on the return. I got plenty of comments that I was looking good and I felt it too. 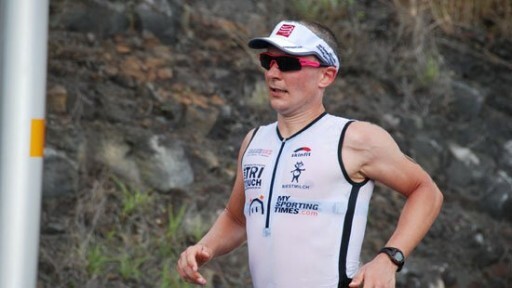 I hit the climb up Palani to the Queen K bang on 3:10 pace and was inspired seeing Macca making his move on Andreas. Less than a mile to go and they were neck and neck, the mens race was clearly very exciting. Third time on the Queen K and the pace dwindled. I tried to maintain focus, but there was ever increasing pain in my hip flexors and adductors. I suspected a lack of run training meant they were currently underdeveloped. I did my best to push on as I recorded sub-8 minute miles. Jogged down the hill in the Natural Energy Lab I was becoming increasingly weak and a little wobbly. By the time I reached the bottom I accepted I had to walk. I made a brief attempt at running after the aid station, but it wasn’t happening. Recalling how last year Macca had fallen off pace, regrouped and pulled it back I decided I’d walk through special needs eat my M&Ms and once I was out of the Energy Lab I’d run again. Taking splits for the miles it was shocking how long walking takes adding to my determination to run again. At my lowest point in the race a whole bunch of friends came running by. Each of them giving me encouragement as they struggled with their own races. It helped me to get back in the race though it was Steven’s huge cry that if I kept going at that pace he’d catch me that really pushed me along the Queen K! Reaching the Queen K for the final time I had no excuses and started running again. The first couple of minutes were agony as my legs had seized up. I promised myself I could walk each aid station, but had to run between. I was roughly aware that maybe I’d break 10 hours too if I could just hold a decent effort level. So there I was hobbling along the Queen K desperate for each aid station and the short break it gave me. I’d certainly come to appreciate how important long runs really are! As I checked the miles off the chance of going under 10 got slimmer. Reaching the 25 mile mark at the top of Palani it was obvious I’d need a sub 6 minute mile to stand a chance. I tried! There wasn’t much chance I’ve done it in the past, but today I’d be lucky with sub 7. I reached Ali’i Drive feeling wobbly, but desperate to finish and unwilling to stop. Pushing as hard as I could to cross the line in 10:00:38 so close to another sub-10. It had been a tough day and to be that close in the circumstances was very satisfying. I couldn’t be disappointed with the result because I’d come in with so many uncertainties. In fact I can see so many positives, the improvement in the swim, the performance on the bike and the knowledge that despite the run build I could still perform like that. This wasn’t my day for a stellar race here, but it gives me confidence that I can have that race here one day. Chatting with friends in the finish area, there were some superb performances amongst them. Whatever their results everyone seemed to have taken positives away from the day. My race season was over and it was time to kick back. I spent the rest of the day eating what I liked and hobbling around to see the final finishers.